LIII, Other Shape Guitar from Music Man in the Luke series. infogratte34's review (This content has been automatically translated from French)" Try it and love it! HUGE!" 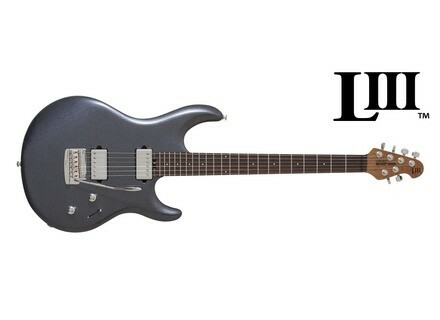 Overview: Released in 2012, the Luke III is the latest in a collaboration between Music Man and Steve Lukather of Toto guitarist. I have the HSS model. Handle relatively thin, super soft to the touch. A real treat! It should handle better guitarists playing with the thumb above (kind Hendrix) as followers of extreme shred with descent lines burst inch below. Access to acute is perfect balance as and does not weigh as heavy as my Les Paul (hopefully! Ya still less wood) but it sounds remarkably well and you can feel good while they vibrate triturated. I had to redo a setting vibrato because it comes in 9/42 and I play 10/46. The push / pull may also require a small adjustment to adjust the rate Boost your convenience (small blue screw). Access is via the plate protecting the electronics. I put only 9 because the Push / Pull is fragile and the be changed quickly. In terms of sound, it already sounds good vacuum, then once connected, it is a killer. This is a super versatile guitar but with character (Dimarzio Pickups Custom oblige!). And that's what I was looking for playing in a dance band, I did not want to lug my two guitars. So, I get sounds from crystal clear (to the Police or U2) big sound full of saturated sustain (the Lukather or Satriani) through crunchy sound more serious than friendly micro or sharp funky sound. It is plugged into a Blackstar HT-40 with a NovaSystem in the effects loop. The boost works very well for all the microphones but mostly I use micro position 1 or 5. I use all the microphones positions following styles and frankly, it sounds serious! The Custom DiMarzio can really afford to pierce the mix. I have 4 months. After a short adaptation time to get to know time (she was a bit shy at first and I was impressed by its beauty. Lol), I do not separate any more and I have the impression that I finally found MY GUITAR after playing Strat Deluxe Telecaster Std Ibanez JS, Vigier Excalibur and Gibson SG and Les Paul. I love the look, the vintage vibrato (no fine-tuning knobs that annoy me) and the bridge pickup sound with the gain 3/4 of the BlackStar, a bit of reverb and delay appropriate and I forget all my worries. alexlion's review (This content has been automatically translated from French)" I'm in love ..."
Olive Gold color is gorgeous! oiled back, it's soft, ca slides alone, happiness. Ergonomics, never seen a guitar so comfortable. not too heavy but enough to still "feel" the instrument. The good news is that this guitar is not that great, it sounds! maybe this is the 3rd generation Mister Lukather signature but can do much more than with TOTO! for clean sounds, I do not really know, I do not play in the clear. not against the distorted sounds are terrible. - The Luke has a sound personality but I notice that it is also very "transparent" with the amp lequelle it is connected, for example sounds more typed my Mesa "Mesa" with Luke with my other guitars .. .
in short, a huge favorite. I use it for a month and a few repets concert and I'm hooked. beautiful color and original handle incredible comfort, versatile and well suited to my registry rock "muscular"
am telling me that I find beautiful as well in the new "luke blue" ... GAS! !